What is a Posting Document? Posting Documents are either implemented on your hosted landing page that is used with a lead gen campaign in CAKE, or they are dispersed to your affiliate for the purpose of server posting leads to a lead gen campaign. 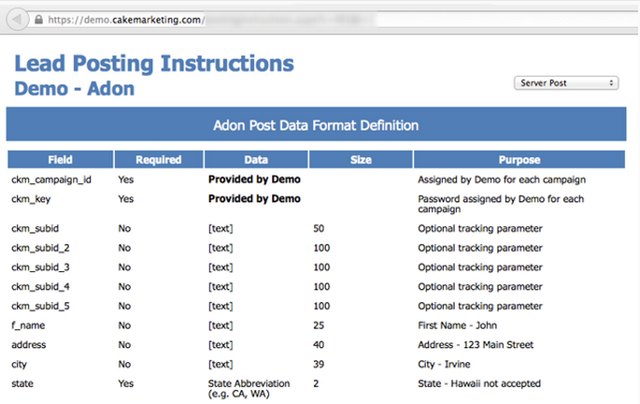 Adding a new posting document will require that you have access to the Lead Gen section within CAKE. Posting Documents are built in the Vertical, as the information that you are collecting should be relevant to industry your Offers are in. First, a Vertical will need to be built assuming the Vertical of choice is not Debt or Tax Settlement as these are defaulted in your CAKE instance. Every Vertical needs a Name and a Category. Click Next and Finish to proceed. Once the Vertical Wizard is complete, your new Vertical will open automatically. Once in the vertical click on the Fields tab. Every Vertical will contain Basic Fields. It is extremely important to understand that basic fields are shared across ALL verticals. 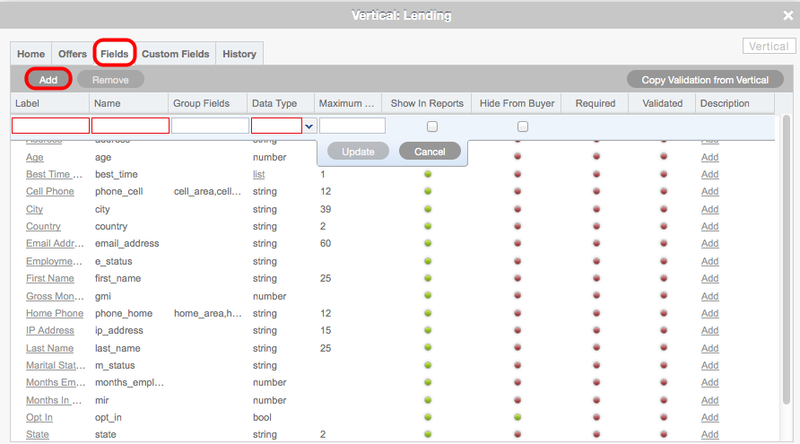 Deleting a basic field in 1 vertical will delete in ALL verticals. Similarly, editing the field name will change in ALL verticals. New fields however, can be added and removed without any consequence to other verticals. To add a new Vertical Field simply click “Add”. The Label is the explanation to the affiliate of the field you are collecting. It CAN contain spaces. Group Fields is a way of receiving 1 field but is being sent into CAKE as multiple fields. Phone Number is usually collected in 3 separate fields but will ultimately build 1 field called “home_phone”. The Affiliate or form may post the fields into CAKE as such: home_area,home_prefix,home_suffix. CAKE will group the 3 fields and make 1 field. 1) String: A String will receive any text sent to Cake. You can apply a Maximum Length to a String. 2) Date: A Date should be used when your form or Affiliate is posting a Date. 3) Number: A Number is similar to a string except Cake can create Validation or Filters using math. 4) List: A List allows for a custom list of values to be built. Any value other than what is on the list will now be accepted into Cake. Values on a list can also be mapped to a specific value the Buyer requires. 5) Bool: A Bool (or Boolean) will accept a value of 1 or 0. It will also accept Yes or No. Maximum Length allows you to place a cap on how many characters are being sent in either a String or List field. Show In Reports allows you to choose whether the new field should be in the Lead Detail reports. Hide From Buyer will not show the new field to the Buyer in the Buyer Portal. Once all of your fields have been added you can now optionally apply validation to each individual field. For example, some fields will be optional where others will be required. Making a field required can be accomplished by adding Validation. To open the validation page, click on the hyperlink for the label you'd like to add validation to. Making a field required is just 1 of many validators CAKE can apply to a field. To add validation to a field, click on the label of the field. The Validators card will open. The most common validation type is making a field required and it is conveniently located at the top of the list. If a field is validated as “Required”, CAKE will need to know how to handle a situation where a lead is submitted to CAKE without this field. Client Post Decision provides 3 options. Selecting a Client Post Decision is required regardless if a lead is being Browser Posted or Server Posted. The Client Post Decision is related to a lead that is being either Browser HTTP Posted or Browser AJAX Posted. Force Client Review is specifically used when the HTTP AJAX Post method is used. This option allows CAKE's validation to communicate with a hosted form when the provided AJAX library is on the form. Review is the 2nd option. Selecting Review will send a lead to the Review Queue if the validation for this particular field fails. Note that this can only be used with a hosted offer, but not a host-n-post offer. Throw Out is the 3rd option. Selecting Throw Out will send a lead to the Scrub Queue if the validation for this particular field fails. Server Post Decision provides 2 options. Selecting a Server Post Decision is required regardless if the lead is being Browser Posted or Server Posted. The Server Post Decision is related to a lead that is being Server Posted into Cake directly from an Affiliate. Review will send a lead to the Review Queue if the Validation for this particular field fails. Reject will send a lead to the Scrub Queue if the Validation for this particular field fails. Error Text relates specifically to Client Post Decision and should be discussed with your Training Manager as it is more advanced. Similarly, Compare Value, Fail on Match and Condition should be discussed with your Training Manager. Once you have completed setting up all of your fields and have applied all required validation you can now generate the Posting Document. To do this simply click on the Home tab of the Vertical card and then click on the button called Posting Doc. This will generate a new window in your browser where you can view the completed Posting Document. You can also copy/paste this URL and provide it to your affiliates.